Lee Rigby's widow and son at moving ceremony to remember murdered soldier's "ultimate sacrifice". 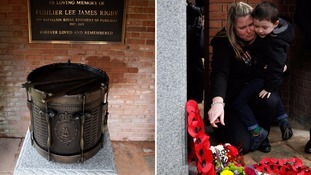 A bronze drum, alongside a plaque for Fusilier Rigby, will be located at Middleton Memorial Gardens. House of Commons Speaker John Bercow has requested an urgent independent inquiry after the Electoral Commission's decision to allow an extremist party to use a slogan featuring murdered soldier Lee Rigby. According to his spokeswoman, Mr Bercow said: "The speaker was told about the Electoral Commission's decision this afternoon. He understands the grave concern felt over this alarming development and awaits (Cabinet Office Minister Greg Clark's) letter. "The speaker wishes to see an independent inquiry, conducted as a matter of urgency. He will look forward to the publication of the report of that inquiry, which he and his colleagues will carefully consider." The Electoral Commission has been forced to apologise after allowing an extremist party to use a slogan featuring murdered soldier Lee Rigby. The watchdog had approved use of the slogan "Remember Lee Rigby" by the 'Britain First' party on voting slips at the European elections next month. Jenny Watson, the chair of the commission, said use of the slogan "should never have been permitted". "We are deeply sorry for the offence that has been caused and I have apologised to Lee Rigby's family," she added. "We are particularly sorry at the pain that this will cause them, particularly since polling day falls on the first anniversary of Drummer Rigby's murder."